Hollywood has seen more than its fair share of former wrestlers, athletes and pro sports stars make their mark on the silver screen. From OJ Simpson to the iconic Hulk Hogan, these natural performers have lit up our screens and brought joy to more than one generation of movie-goers. Not since the great Arnold Schwarzenegger has one man shone like Dwayne Johnson, whose 6 foot 5-inch frame and muscular, 120kg gram has become a dominant force of nature in Hollywood. While his immense physical presence is hard to ignore, however, it’s Johnson’s natural charisma that really defines his on-screen persona. This is also central to the man’s considerable off-screen appeal, which is also empowered by a clean, simple and accessible sense of style that the everyday man can identify with. Make no mistake; this has helped to establish Johnson (or the Rock to you and me) as a modern-day fashion icon, and one who’s look can be relatively easily replicated without spending the earth. So, let’s get to grips with Johnson’s unique sense of style and how it’s applied across different outfits. In the case of many stars with larger frames, they’re content with shrouding themselves in shapeless, baggy garments and drop-sleeved tees. The issue with this is that it can make individuals appear bigger, while it does not do justice to muscular physiques that have painstakingly honed and shaped. Instead, Johnson has developed a style that flaunts his impressive physique, simply by wearing tailored and well-fitting clothes that create an exceptionally clean and often immaculate look. This is best reflected by Johnson’s smart attire, which is dominated by a range of tailored and plaid suits and classic colour combinations such as white, black, navy and grey. He’s also known to favour an open-neck shirt in most instances, although a slim, plain and matching tie may also be preferred for more official occasions. One of the best examples of this is the window-pane-style plaid suit that Johnson donned for the premier of Hercules in 2014, which was slim-fitting and beautifully accessorized. Featuring a brown and blue gingham shirt and navy tie (along with brown shoes), Johnson’s outfit managed to tread the fine line between classic style and bland attire. Arguably, Johnson managed to achieve this balance by combining more than one patterned garment (suit jacket and shirt) within an otherwise solid block of colour, which reflected the leading man’s unique and clean sense of style while keeping the outfit firmly grounded. Make no mistake; this is the archetypal smart look for Dwayne Johnson, and it is one that perfectly encapsulates the man’s simplistic but enduringly stylish sense of fashion. A similar philosophy defines Johnson’s casual look, which is largely dominated by the edgy fashion brand Roots of Fight (ROF). Perhaps somewhat unsurprisingly given the name of this clothes line, it depicts martial arts images and influences from across the globe, while paying homage to fighting and pugilistic legends such as Bruce Lee, Mike Tyson and the incomparable Mohammed Ali. Interestingly, Johnson’s love of the brand helped to propel it into the mainstream, as he began to share photos of himself the line’s garments with his 60 million-plus Instagram followers. 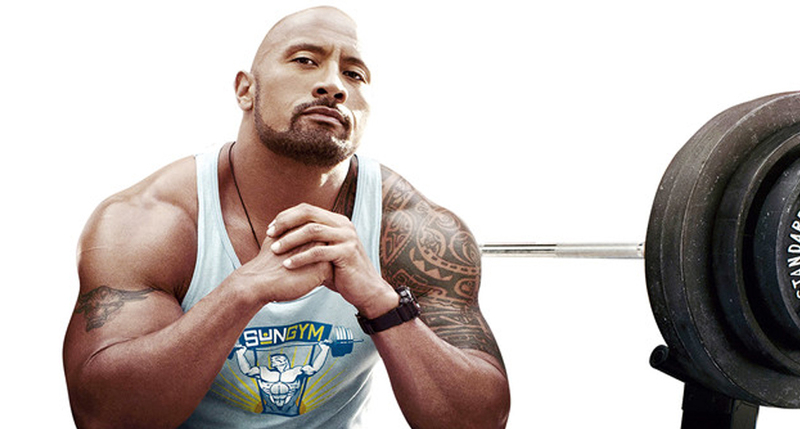 One particularly famous image sees The Rock donning a tight, crew neck T-shirt featuring Mike Tyson’s name and the city of New York, with the picture reflecting a comfortable and eye-catching garment and a contemporary blue and red colour combination that is typical of the man’s fashion sense. If Johnson isn’t wearing a slim-fitting a crew neck T-shirt, the chances are he’ll have donned a V-neck alternative. The depth of the V will vary, but typically Johnson will favour the classic and masculine colours that he’s known to love, including grey, navy blue or, in most cases black. This is an obvious choice for a man of Johnson’s shape and physique, as it flatters a wider neck and places focus on an incredibly fit torso. It also has the added benefit of displaying Johnson’s tribal tattoo, which is influenced by his Samoan roots and remains a seminal part of his heritage. When combined with classic denim blue and black jeans (or occasionally stonewashed garments), Johnson is able to recreate a classic and timeless look that is renowned across the globe. As you would expect from a man with Johnson’s simplistic sense of style, his smart and casual wardrobes have a tendency to merge when the occasion arises. 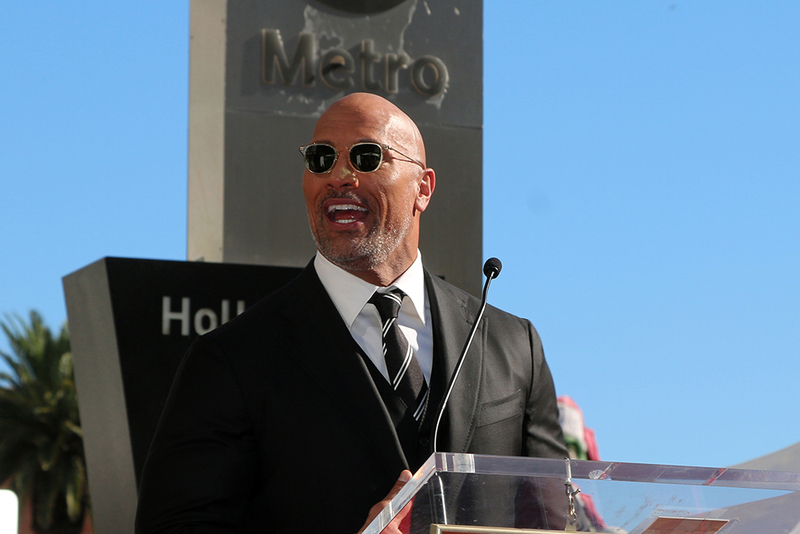 Make no mistake; The Rock’s smart casual attire represents a clear meld of these distinct styles, creating a range of familiar and accessible outfits that are innately stylish. Johnson will often revive the timeless combination of block colour suit jackets and blazers with smart jeans, for example, with shades of grey and dark blue particularly popular. Beneath the suit jacket, Johnson will often wear a smart V-neck t-shirt or plain, monotone top, along with casual black or brown shoes. If the suit jacket is deemed just a little too formal, Johnson will combine his dark denim jeans with a simple, block colour shirt, with green and brown particular favourites for the former wrestler. This shirt will typically be worn with an open neck, with matching, converse-style sneakers completing the look. When making official public appearances, however, there’s little doubt that Johnson’s interpretation of business or smart casual leans a little towards the formal. This was underlined by the star’s appearance on The Tonight Show earlier this year when he donned one of his favourite plaid suits, a striped dress shirt, cufflinks and smart brown shoes. This outfit bore the classic and unmistakable hallmarks of Johnson’s style, and it was only the absence of a tie that stopped it from being smart and formal. Instead, Johnson unfastened the top two buttons of the shirt to create a more casual open-neck look, transforming the aesthetic and creating a more accessible sense of style. We already know that Johnson has a passion for the ROF clothesline, and he’ll often wear the brand’s garments while visiting the gym. However, Johnson is also something of an ambassador for the popular sportswear brand Under Armour, having taken to Instagram to announce a partnership with the company late in 2015. More specifically, Johnson is an official endorser of the brand, while Hollywood’s leading light has also worked closely with the brand to create his own line and range of apparel and accessories. Featuring everything from vests and T-shirts to accessories and film-inspired sneakers (relating specifically to Johnson’s latest hit movie), this range continues to grow and reflect the fashion sense that defines the man. This range will certainly encapsulate Johnson’s clean and simple gym style, which is itself defined by slim-fitting vests straight from the Under Armour range. These are typically in block colours of black, white or grey, while Johnson will tend to augment this look with matching and looser shorts. For some, the dearth of colour may pose something of an issue, but Johnson’s physique, classic style influences, and incredible self-confidence elevates the look and earmarks it as something that is both desirable and accessible in equal measure. It’s almost enough to make us want to work out every day, which is no mean feat in itself! It’s sometimes said that the clothes make the man, which hints at how style can prevail over substance and serve as a sign of status. In the case of Johnson, however, it’s arguably the man who makes the clothes and turns a classic, clean and potentially plain sense of style into something that appeals to men of all descriptions. We should also remember that the innate simplicity of Johnson’s look is also central to its universal appeal, as it can be replicated on a relatively small budget and is therefore far more accessible than the wardrobes of many alternative Hollywood starts. In this and many other respects, Johnson’s sense of style also appears to be authentic and entirely in keeping with the man. After all, Hollywood has scarcely seen a more quietly confident or unassuming leading man, with the former wrestler cutting an incredibly relatable figure on the silver screen. This is not to say that Johnson has not had helped in elevating his style or presenting an immaculate public image, with his personal fashion designer and stylist Robert Maza playing an integral role in bringing all of Johnson’s influences together. Still, it’s Johnson who stars in the clothes that he wears, while blazing a style trail for his fans to follow in the process! Ultimately, Johnson’s look is one that revels in simplicity, while combining classic trends with occasionally unusual adornments to elevate it to a higher plane. On a final note, it’s also a textbook example of how bald men should dress, as they look to accentuate their muscular forms and make the most of their bold new aesthetic.